The patio in front of your property will be perfectly washed and looking good if you use our reliable services. We can take care of the flawless state of the natural stone tiles, pavements and slabs in your outdoor areas by washing them thoroughly. 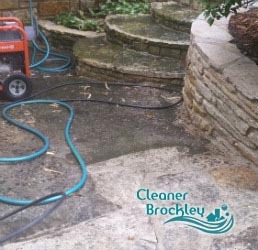 Our employees are background checked and qualified to carry out professional patio cleaning that can be booked by the residents of Brockley SE4 at any time. Call us to have your estate checked and get your no-obligation quote. We can make your paved, tiled and wooden outdoor areas spotless and impeccable in a matter of hours. Our workers are supplied with powerful and effective jet washing machines that function under pressure using hot or cold water. They have the skills and knowledge to implement effective removal of all contaminants and pollutants that have grown or appeared on the slabs. Using the machines, our workers will remove all stains, moss, weeds, scratches and stains. The natural stone surfaces will be washed of the grime and become perfectly refreshed. Our cleaning technicians can help you make your property for rent and sale more attractive to customers. 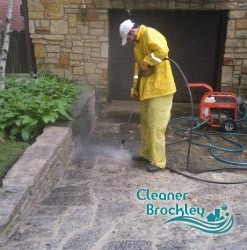 Our company operated in the SE4 region providing some of the most professional patio cleaning services in London. Patios are exposed to all kinds of weather conditions and can get very messy and looking faded over time. You can restore their clean and nice appearance by using our trustworthy services. Get in touch with our company, based in SE4 to book your patio cleaning for a preferred day and time. We will do what it takes to restore the paved, natural stone and other outdoor surfaces in your property.